Benelongs is an online business, selling quality woodworking tools and accessories to professional and enthusiast craftsmen. The client came to us with a name and we did the rest, developing the company logo, tagline, stationery and ecommerce website with content management system, allowing the client to manage the website themselves and easily add new products and update pricing. 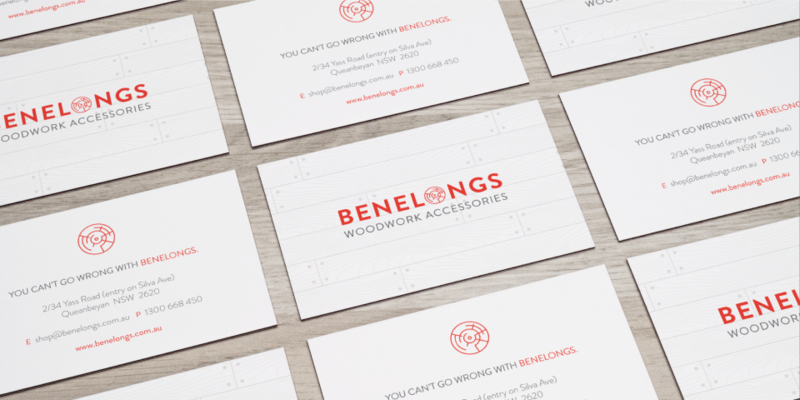 We really enjoyed developing the visual identity for the Benelongs wood working company. The client had picked out the business name but everything else was left up to us. Our goal was to create an identity that looked professional but also had a bit of a rustic feel to it, something that would connect with enthusiast wood workers. With somewhat of an obscure name, we chose to include the tag 'Woodwork accessories' in the core logo, really so people would know what this brand was about on first contact. We chose to use a bright red and bold font for the logo to capture the modern, industrial side of the business and combined this with a graphic interpretation of a cross cut timber section to make the 'O' in the logo. 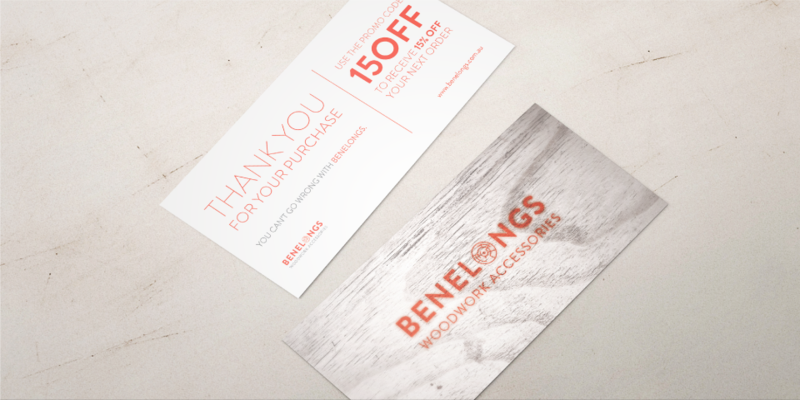 We then used timber elements for the business cards and flyers to add a more 'handcrafted', rustic feel. 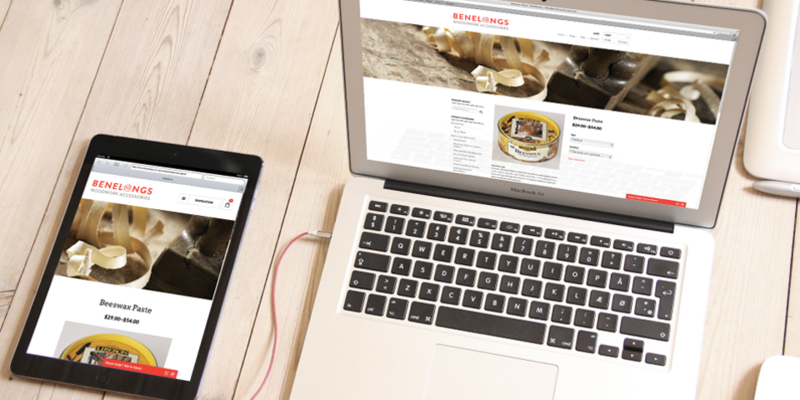 The Benelongs website features a responsive design utilising the WordPress content management system that integrates with WooCommerce to provide an easy to use backend with shopping cart capabilities. The overall design is clean with an emphasis on one key hero image and an easy to navigate site structure. The home page features four clear calls to action, promoting the shop and specific shop categories, allowing customers to quickly navigate to their chosen area. We discussed numerous pricing strategies for postage fees, deciding on a low flat rate of $3 per order, promoted on the homepage to encourage orders. Key features of the shop include the ability for users to search and filter by product categories as well as by price and sort by popularity and date added. The FAQ’s page details a range of commonly asked questions, deterring unnecessary phone and email requests, whilst a live help chat is available during business hours allowing the client and users to connect instantly and securely on the website.